Man Food… it’s taking over the internet this week! In anticipation of Superbowl Sunday, folks are pulling out all the cheesy, greasy, chicken-wingy stops. While I could never pass for a sports fan, and (real talk) probably can’t even bring myself to watch the game, I can’t pass up a chance to indulge in some good old-fashioned Americana… dietitian-style, naturally. 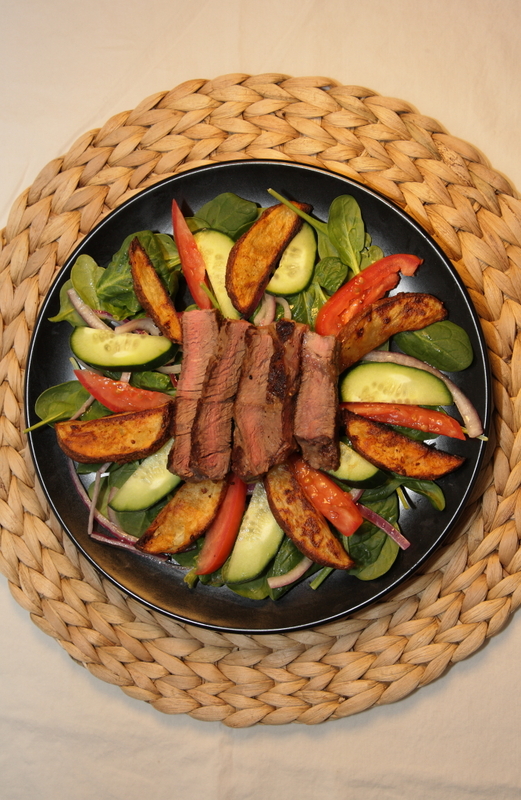 While not exactly football finger food, this salad is my veggie-lover’s take on the meat-and-potatoes movement. I’ve mentioned before that I don’t eat a ton of meat, and red meat in particular is an infrequent grocery purchase in the flavorRD household. Partly because we find it heavy, and partly due to the expense – especially for the grass-fed beef we prefer. But occasionally, a good dense source of protein and iron (more on that later) is exactly what we need. And I know I’m not alone in appreciating something special about cooking a good steak. Sizzling. Celebratory. If you’re into meat and potatoes, this is the way to do it. Instead of a monstrous slab of cow and enough potatoes to feed an army, eat the proper portion atop a base of fresh veggies making up the bulk of the meal. You can use whatever vegetables strike your fancy – I think roasted asparagus would be a fab addition. Arugula would make a great base also, but today I went with tender baby spinach. Science Aside: we often hear that spinach is a source of iron, which it can be (especially when cooked, where a mountain of leaves transforms into a manageable serving). But the iron in spinach, and all plant sources, is what we call non-heme – this form is more difficult for our bodies to absorb. Beef contains easily-absorbed heme iron, and it also contains a compound known as MFP factor, which enhances our ability to absorb even non-heme iron sources. By eating our steak and spinach together, we create the perfect storm of iron absorption! Watch your back, anemia! 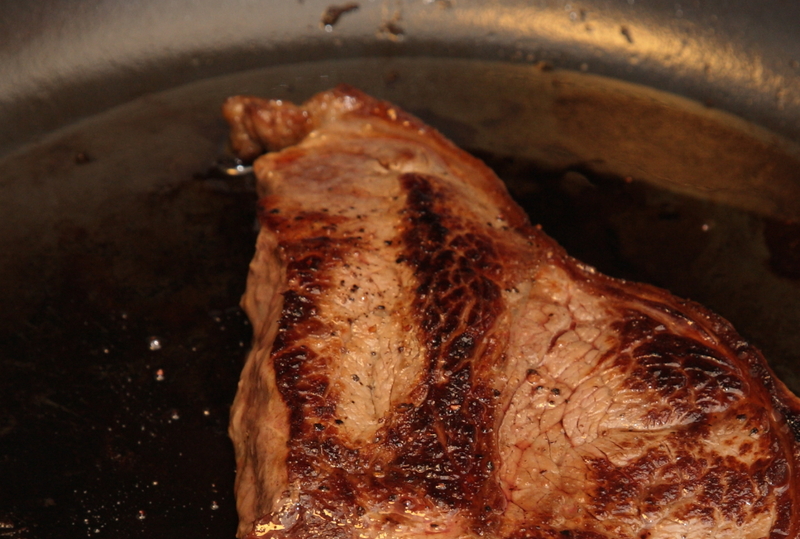 I cooked the steak simply, salt-and-peppered in a hot cast-iron pan. The potatoes are oven-roasted, also simple, but I decided to fancy things up by first tossing the wedges in olive oil spiked with paprika, grainy mustard and a touch of maple syrup. Don’t tell the steak, but these potatoes may actually steal the show. If you’ve ever wished croutons were more like french fries, you’ll understand how they may stand out as the superstar of the salad. I might call them the quarterback, but let’s just leave the football analogies to someone more qualified than myself. Preheat oven to 400° F. Slice each potato into about 12 thin wedges and toss in a medium bowl with olive oil, paprika, mustard, maple syrup, and salt and pepper to taste. Arrange the potatoes on a baking sheet and bake for 20-25 minutes, flipping them halfway through, until crisp and golden. Meanwhile, heat a cast-iron pan over medium-high heat. Season the steak with salt and pepper, and cook both sides until your desired doneness is achieved. Allow the steak to rest for 5 minutes before thinly slicing. Arrange the spinach, onions, tomatoes, and cucumbers between two dinner plates. 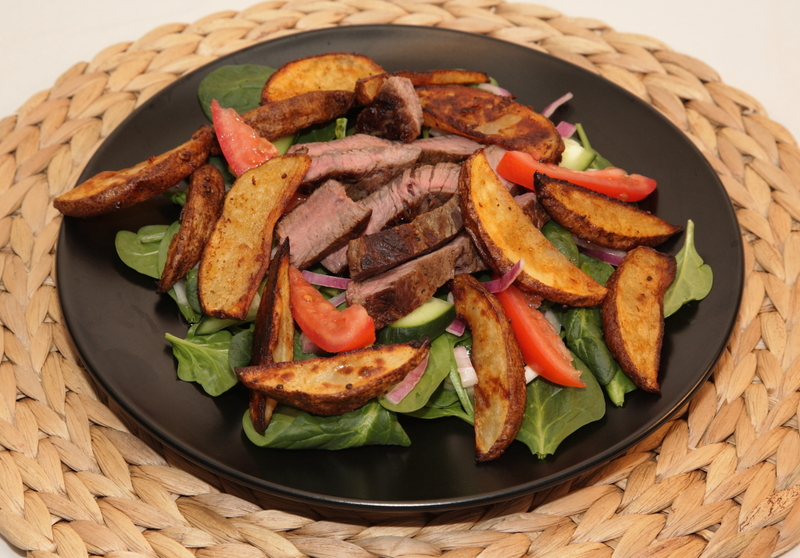 Top with the steak, potatoes, and your favorite salad dressing - I used a homemade dijon vinaigrette.